The board of freeholders in Gloucester and Camden Counties hosted the commemoration on the deck of the New Jersey Battleship. Local Marine veterans saluted the flag as the Memorial Wreath Ceremony commenced on the deck of the Battleship New Jersey. The USS New Jersey battleship was once again occupied by World War II military members on an overcast morning on Tuesday. Local veterans and numerous others were honored during Camden and Gloucester counties’ annual Pearl Harbor Day Commemoration that was held on the deck of the BB-62, the most decorated warship in the United States. Set to the sounds of Eastern Regional High School band’s patriotic compositions, local officials and servicemen and women reflected on the 76th anniversary of the calamitous attack by the Imperial Japanese Navy Air Service against the American naval base in Hawaii. With nearly 2,400 lives claimed, it was the worst attack on American soil up until that point. The BB-62 set sail exactly one year later, joining the cause to counter dictatorship forces emerging from many corners of the globe. From Philadelphia to the Philippine Sea, the ship weaved around the world until the war ended in 1945. 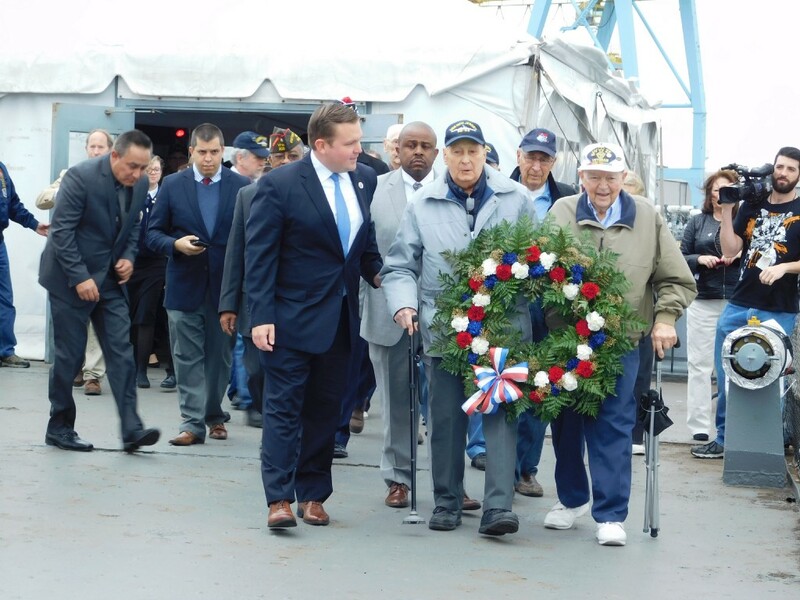 Camden County Freeholder William F. Moen, Jr. leads local World War II veterans to the deck of the Battleship New Jersey where a Memorial Wreath Ceremony commenced. Roughly 30,000 veterans call Camden County home, according to Moen. One Cherry Hill resident, Perry “Jonny” Levine, an officer of the Jewish War Veterans Post 126, received the Reverend Peter A. Molnar Award for outstanding service and commitment to Camden County veterans. He served three years on active duty as a U.S. Navy Supply Corps officer, three years in the U.S. Navy Active Reserves and three years in the U.S. Navy Stand By Reserves. He serves as the post acting adjutant for JWV Post 126. He also serves as the chief aide for the JWV department of New Jersey. Aside from serving as a Battleship New Jersey trustee, he teaches computer science at the Cherry Hill Public Library in his spare time. In his acceptance speech, Levine encouraged all veterans in the audience to rise as they received a resounding applause. “Please remember that veterans are heroes forever,” Levine said. 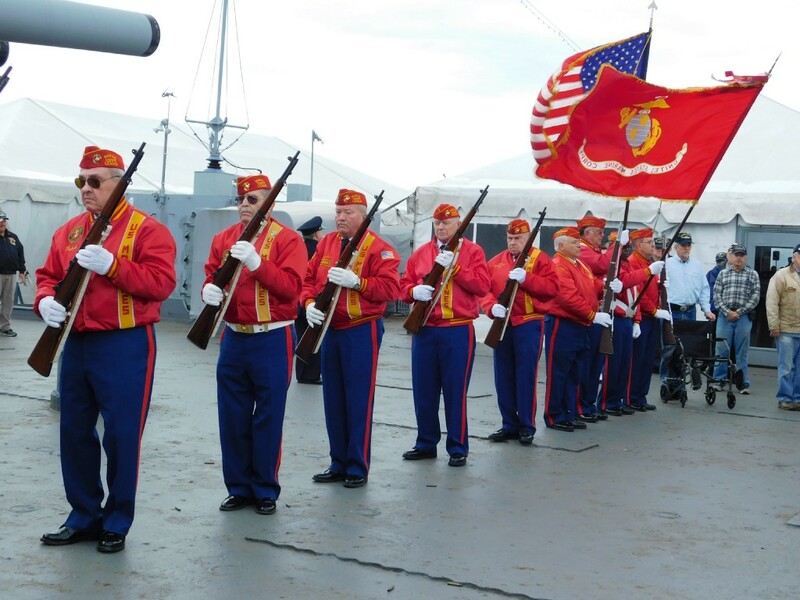 After Levine was honored, veterans and their families proceeded to the deck’s perimeters, commencing the Memorial Wreath Ceremony where retired Marines performed a traditional gun salute. As the festoon, provided by horticulture students of the Camden County Technical School, flew into the Delaware River, Coast Guard members watched from a raft. The veterans made their way back to the crowd as the band greeted them with the 21-Gun Salute — a medley of the five military anthems. The servicemen and women stood during their respective anthems, while audiences expressed one last wave of gratitude and reverence.